The weather in Perth is finally becoming jacket weather. Colder weather calls for comfort food, maybe because we all tend to hibernate more and stay in rather than go out. You eat more of comfort foods, so it can help us beat the cold, as we need to eat more to get more energy to generate heat in our bodies to keep warm. I have previously written about two of my comfort foods. This is my third comfort food that I cook a lot of – Chinese meat loaf. This dish is a combination of a meat loaf and omelette. It’s a hearty home style dish that I grew up eating, I always looked forward to my mum cooking it, it may be just a mixture of pork and eggs but it is flavoured with two of my favourite ingredients – shittake mushrooms and dried scallops. This is one of those dishes where there is no definitive recipe and every family would have their own recipe. My family puts in dried scallops which are expensive but I love the flavour that it adds to the dish and I think that it brings everything together. It’s not very fancy as you can see, it’s not something that you can make look pretty on a plate – it’s just spoons of steamed pork mixture on top of rice. Thoroughly mix together the pork mince, spring onions, shitake mushrooms, dried scallops, oyster sauce, fish sauce, soy sauce, salt, white pepper and cornflour in a large bowl. Cover and refrigerate for one hour. Add the eggs to the pork mixture and thoroughly mix together, breaking up any clumps of mince pork. (There are two ways that I mash the pork and the eggs together – (1) using a spoon and mashing the pork mixture against the side of the bowl or (2) mashing the pork mixture between two spoons). Brush a shallow heatproof bowl with oil and pour the mixture in. Steam low-medium heat for around 30-35 minutes or until cooked. This dish uses a caramel sauce but not in the French sense which most people would be familiar with, where caramel is made by heating sugar with water, milk or cream and used in desserts. The caramel sauce used in this popular Vietnamese dish called “Ca Kho To” (Vietnamese braised fish in clay pot) is sugar mixed with fish sauce. This kind of caramel sauce is widely used in Vietnamese cooking for braising dishes to provide an intense, sweet and savoury umami packed flavour to foods and also produce a glazed appearance. This dish is best cooked in a clay pot. Clay pots are good to use for braising and slow cooking dishes as it doesn’t get as hot as metal so it keeps foods at a low simmer, it distributes heat evenly, holds temperature at a constant rate and retains the moisture in ingredients. This helps in the caramelizing process as it gently cooks and develops flavour. Clay pots also retain heat so that long after serving your food it will still be hot. I have to confess that I have broken two clay pots while cooking. Clay pots require special care when using. They have to be soaked in water first before use and are very sensitive to sudden temperature changes (ie: allow the clay pot to warm gradually and do not add cold liquid to a hot pot). If you do not use or care for your clay pot properly it can crack. But I have found a crack proof clay pot…it says so on the box and I have not had any trouble with it so far. I don’t even have to pre-soak it in water either. This clay pot is like the non-stick version of frying pans. I found it at Lucky supermarket on Brisbane Street in Northbridge. This dish has intense flavours with a savoury umami fish sauce based caramelised sauce balanced with sweet, salty and peppery flavours with hints of chilli and ginger. The resulting sauce is delicious that I would just be content with having the sauce with rice. Cook the sugar in a small saucepan over low heat, swirling the pan constantly until the sugar liquefies and becomes brown and caramelized (be careful that you don’t let the sugar go too dark brown or it will burn and you’ll get a bitter taste). Remove the saucepan from the heat and stir in the fish sauce (it will smoke and bubble vigorously). Return the sugar/fish sauce mixture to low heat and gently boil for about 3 minutes, stirring occasionally until the sugar has dissolved. Add the shallots to the saucepan and some freshly ground pepper to taste. Set aside to cool before using. Heat a little peanut oil in a claypot on medium heat, add the garlic, ginger and chillies and stir fry for a bit until fragrant. Add the caramel sauce into the claypot and then add in the fish pieces. Add in some young coconut juice to just barely cover the fish. Cover the claypot, bring to a boil, then reduce the heat to low and simmer for about 45 minutes, turning the fish occasionally (the sauce with thicken and the fish will caramelize and brown). Season with salt and pepper to taste. Serve with rice topped with coriander. I pretty much avoid all fast food franchises but I have to confess that I have a soft spot for KFC and now and then when I past a KFC outlet I will go in and get myself some of that 11 herbs and spices. I generally get a little box of popcorn chicken as it’s a small serving so I can feel less guilty about the indulgence. I think my soft spot for KFC chicken stems a little from nostalgia…I remember back in the day when KFC restaurants offered buffet facilities and a weekend treat for my family would be to go to the KFC buffet in Mirrabooka and eat as much fried chicken as we could. It’s funny because my dad is a chef and we would always have so much amazing food at home but eating KFC was cool for my family because it was Western and different - so it was a treat. Maybe this could be considered a part of our assimilation into Australia society. As a Western nation, fast food does form a big aspect of our culture. Do you eat KFC (or substitute more relevant fast food franchise here)? But seriously, who doesn’t like fried chicken (vegetarians exempted)? Whenever I requested a chicken dish at a restaurant while traveling around Japan last year, they would always bring out karaage. Chicken karaage is a very common Japanese dish. The word ‘kara’ refers to China as the method of preparing the chicken (deep frying foods lightly coated in starch) was taken from Chinese cooking and ‘age’ means deep-fried. Sometimes the chicken karaage that I had was very simply seasoned and other times when I ordered chicken karaage it had stronger flavours with hits of garlic and ginger. I like chicken karaage which has more intense flavours. After coming back from Japan I wanted to try making the best chicken karaage. I read a few recipes off the net and put together a marinade for the chicken (the key is to just test whatever seasonings you want to put into the chicken until you are happy with the taste, I desired a more gingery flavour). I also picked up a tip that in order to get a really crunchy coating the trick is to deep fry the chicken twice. In a small bowl, mix the marinade ingredients together – ginger, garlic, soy sauce, sake, mirin and sugar (taste and adjust seasonings if desired). Chop the chicken into bite-sized pieces and put into a bowl. Add the marinade and mix well. Marinate the chicken in the fridge for a few hours (4-6 hours/or overnight). Drain the marinade mixture from the chicken, take out the chicken from the bowl that it was marinated in and put into a clean bowl. Put some cornstarch in a bowl/plate and sprinkle in some salt. Roll each piece of chicken around in the cornstarch until evenly coated and shake off the excess. Deep fry the chicken in oil twice. Heat up a saucepan with vegetable oil, when the oil reaches 160C, drop the chicken pieces into the oil and fry them for a 2-3 minutes until they float. Take the chicken pieces out of the oil and transfer onto a plate lined with paper towels. Let the chicken pieces sit for a few minutes (this allows the juices in the meat to return to towards the outer part). Let the oil reach 180C and then fry the chicken pieces again until golden and crunchy, then transfer the chicken pieces onto a plate lined with paper towels to absorb the excess oil. Deep frying the chicken karaage twice ensures that the chicken pieces are crunchy and remain crunchy after a few hours! As you bite into the piece of karaage you will get a little hit of salt from the crunchy outside coating and then tender chicken with an imprint of soy/gingery flavours. Not only is this chicken good when hot but you can refrigerate any leftovers and eat them cold the next day. Another Japanese chicken dish I have made is Chicken Nanban. RTRFM (92.1fm) is a local community radio station based in Perth, it doesn’t get any government funding and survives on subscriptions during Radiothon, sponsorships and fundraising events that it organizes throughout the year. 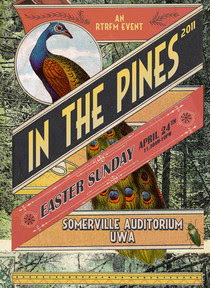 In the Pines is the biggest RTRFM fundraising event of the year comprising of a line up of 20 local bands over 10 hours across two stages in the lush surrounds of the University of Western Australia (UWA) Sommerville Auditorium. 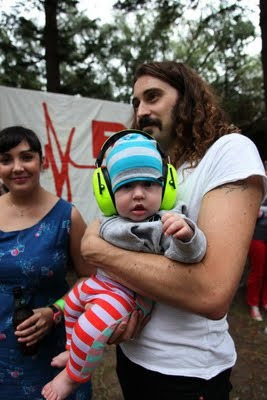 You enjoy bands in a relaxed atmosphere, most come with a picnic and it’s also fun for the whole family where quite a few bring along their kids and you’ll see them running around with big industrial ear muffs to protect there little ears from the noise assault. In the Pines is a bit like the Big Day Out Festival but it’s a local version with all Perth bands. In the Pines is also unique to Perth and there is no other event like this in the rest of Australia. A lot of this has to do with the fact that Perth is small and also very isolated which facilitates the organization of such a festival. Whenever one of my friends move interstate, I would ask them how the local music scene was and they would tell me that they haven’t been able to engage with it like they have with the Perth local music scene. In Melbourne, for example, their music scene is so big that in different areas such as Richmond, Geelong, Fitzroy etc. they pretty much have their own individual music scenes. Whilst in Perth, there are fewer bands and only a handful of venues (The Bird, Rosemount, Amplifier, YaYas, The Bakery, Manhattans) that serve the local original music scene based mainly around the metro area near the City and a few in Freo (Mojos Bar, Swan Basement, Norfolk Basement) This situation has made is possible for a music community to develop where everyone knows everyone else, it is easier to be on top of the local music scene and know what’s happening. The Perth music scene may be smaller than our eastern counterparts but the variety and quality of the artists that we have is amazing and one of the reasons why I love living in Perth. There was a documentary made in 2009 called Something in the Water which explored how Perth ‘the most isolated city in the world’ has produced a prolific, successful and internationally renowned original music source. Some even call it “the new Seattle”. Perth is home to many popular Australian artists, notably - INXS, Scientists, The Triffids, Eskimo Joe, Little Birdy, Gyroscope, Snowman, The Panics, Tame Impala, Jebediah, Karnivool….the list could go on forever. However, there are also a lot of Perth bands that have been around for years and have never quite made it as big as they should have due to our isolated state which can be problematic for touring, recording and promotion. Some bands choose to leave Perth and move over east with varying degrees of success. But many are just happy to stay in Perth and do their thing, even if they are just playing to a room of 10 people. For many of the bands that I have followed throughout the years (those who know me well know that it’s no secret that my favourite Perth bands are The Tucker B's, Adam Said Galore, The Tigers, Mukaizake and Umpire), money and fame never appears to be the priority so I always find it a humbling experience seeing local bands as I feel that they are just keeping it real. 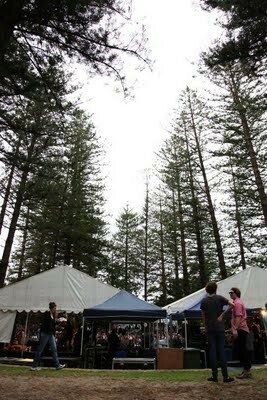 In the Pines is a great opportunity to see what the Perth music scene has to offer – to not only see the best but also see some new upcoming bands. So if you are a band just starting out and you get to play In the Pines, it’s a real buzz. This year was the eightieth In the Pines held on Sunday, 24 April. My highlights were - Simone & Girlfunkle, Wolves at the Door, Tangled Thoughts of Leaving, 6s and 7s, Umpire and Abbe May. Simone & Girlfunkle – I have to declare that these girls are my friends to prevent accusations of bias but the fact is that they write great melodies with sweet harmonies and they are also big dorks. Wolves at the Door – First time that I have seen this band and I was impressed. They reminded me of Warpaint, a band that I fell in love with earlier this year when I saw them live at the St. Jerome’s Laneway Festival. Tangled Thoughts of Leaving – Another first for me. Tangled Thoughts of Leaving was the first band of the day to get some of the crowd on their feet and to the front and I really enjoyed their progressive post-metal sounds. 6s and 7s – I’m generally not a fan of this kind of indie-pop, I tend to the enjoy the darker recesses of indie music but whenever I see the 6s and 7s there are a few songs that I cannot help but bop along to. Umpire – The best band of the night for me. Umpire are one of my favourite Perth bands. They are more than just your usual indie-rock band, the songwriting is brilliant and they use fancy tunings to create a wall of sound. It was also great to hear some new tunes. I’m looking forward to their CD Launch at the Rosemount on the 4th of June. Abbe May – The final act of the night. I find her blues-rock sounds, dirty guitar riffs and soaring vocals infectious and it was a great end to the night. Besides watching bands, chilling out, drinking and hanging out with friends at In the Pines, you also need to eat. You can’t go through a 10 hour festival without eating anything but I and I’m sure a lot of other people as well baulk at the thought of food at a music festival. I know that it will be fast food, greasy, food that can be prepared in bulk for the masses with questionable handling techniques, undefined storage conditions, perishable, delivered in a combi van (well one can hope!) and high in unsaturated fat, sugar, salt and everything else that’s bad for you. But eating at a music festival is about subsistence, you need to keep your energy levels up and have something to soak in all the alcohol you consume. So don’t expect anything gourmet. In The Pines gives you PAWS (People & Animal Welfare Society) which provides vegan catering. The previous Music Director at RTRFM was vegan and the current Music Director is vegetarian so very unique to the In the Pines food experience is the offer of meat free food. Last year only the PAWS van was on offer but due to some feedback meat options were provided this year. The UWA Guild Catering was brought on board as they already have an established base at the Sommerville Auditorium. I didn’t bother with the Guild Catering as I am forever haunted by my UWA student days. I gave the Guild food a miss...all I ever saw being pumped out of there was nachos. I headed to the PAWS van for food. I think that going meat free at a music festival is a good thing so that food poisoning is one thing less you have to worry about while at the festival. You can’t get food poisoning from eating vegetables. PAWS offers a meal deal of rice and dhal accompanied by various veggies stews and curries. I choose to have burger which was filled with lettuce, beetroot, tomato, tomato sauce, mustard, pickles and a veggie patty. The veggie patty provided texture but it didn’t do that much for me taste wise, I have eaten much better veggie patties and I think that maybe some spice and herbs in the mix could greatly improve the burger experience. My favourite veggie patty is produced by Tally Ho Farm, this was the veggie patty that made me think that it was possible for a vegetarian burger to taste good. However, the inclusion of beetroot, pickles and a dose of mustard injected enough additional flavour for me to give the burger a pass mark and fill me up contently. Besides, I don’t go to a music festival for the food, all I really need is some hot chips to get me through the day and I can say that the hand cut chips served by PAWS are A+. Who can resist chomping down on some hot chips after a night out? There is something really satisfying about stuffing your face with hot chips when you are tired and drunk and thus, hot chips is the perfect festival food. Actually, deep fried anything is awesome music festival food, PAWS also do good spring rolls and samosas. p.s. If you are interested in checking out some local Perth music, get into the WAMi festival 21-28 May.